Wave Wrap mallets feature a clear sound across an expanded range of the keyboard. It is Marimba One's most articulate and responsive series to date, and is available in both rattan and birch handles. Increased Striking Range and Responsiveness: The highest concentration of yarn is wrapped around the mallet's "equator", creating an increased striking surface and a mallet that is more responsive on a larger range of the keyboard than any other mallet. Articulation and Balance: The Wave Wrap's blend of wool and nylon yarn minimizes contact sound and enhances articulation. Using Wave Wrap™ technology, the mallet is balanced to facilitate the ease of movement in the player's hand. 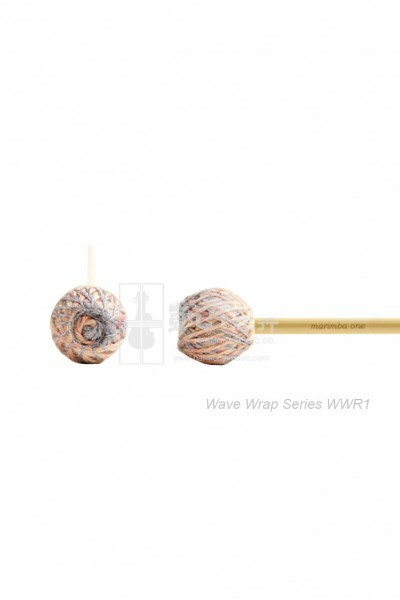 Beauty: The Wave Wrap creates a chevron pattern around the playing surface and a distinctive wave on top of the head - two unique visual signatures for these finest of marimba mallets.